Community is good for people and business, and it’s clear that community-building strategies are a key market differentiator in the multifamily industry. “A sense of community” is the top driver of apartment resident satisfaction. People will pay up to $200 in rent increases if their friends are living in the same community. Research shows that Apartment Life adds approximately $188,154 in annual financial benefit to the average community through reduced resident and staff turnover, increased leasing, and the value added for residents through an increased sense of community. 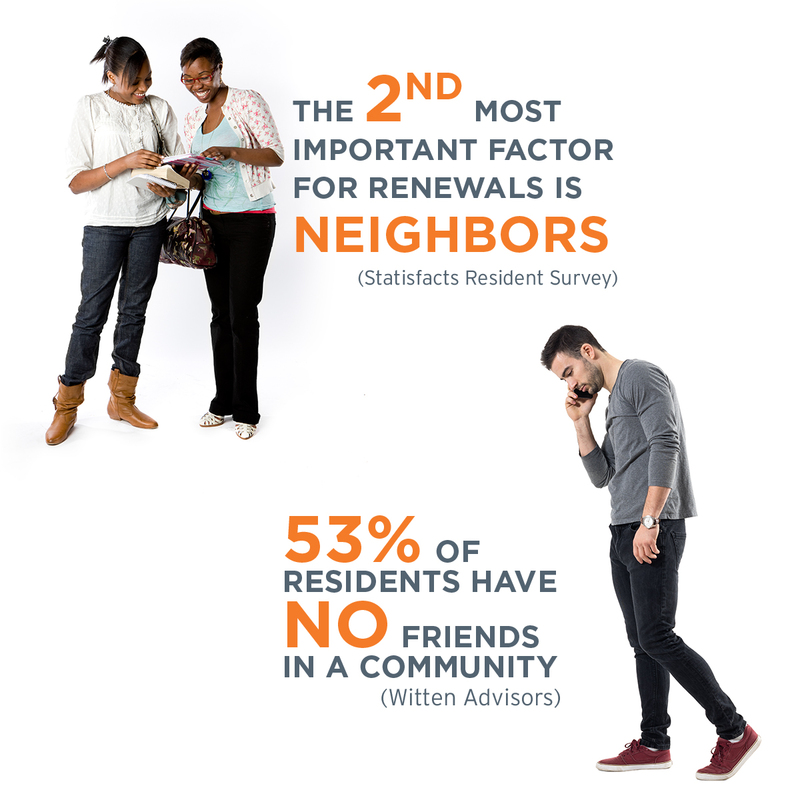 Apartment communities are filled with people who are hungry for relationships, but one study suggests that half of apartment residents don't have any friends where they live. Apartment Life's passion is to meet that need while transforming lives and providing clear business value for our clients. Read more about how we can impact your resident retention and online reputation. Good for People. Good for the Bottom Line. Care: We are committed to helping with practical needs and emotional support. Connect: We look for ways to connect residents with their neighbors, management staff, and for those who are interested, with a local church or faith community of their choosing. Call: Creating community is a team effort; we invite others to partner with us. These principles are incorporated into our resident programs, which can be tailored to fit your community's unique needs. For an in-depth understanding of our programs, we encourage you to listen to this podcast interview with our CEO, Pete Kelly. "Our Apartment Life Team is in a great position to get our residents talking about their experience. After they conducted an email marketing campaign to encourage residents to go online to rate their experience, our community experienced an eight-point increase." Apartment Life offers onsite and offsite programs that can be tailored to meet the specific needs of your community. We serve everything from high-end downtown communities to workforce housing, in big cities and smaller suburbs. We can tailor our program to fit the unique needs of your residents. For more info on our programs, read this. Don’t see Apartment Life near you? Let us know about your interest so that we can consider bringing Apartment Life to your area! can bring to your bottom line.